Tasty, pretty and fragrant, this is a beautiful method of preparing basic rice. If you can only find regular coconut milk, buy 2 cans and use the thick cream that's floating at the top. The coconut cream will caramelize during cooking, leaving sweet brown flecks in the rice. See Why it is recommended to cook rice with coconut oil! 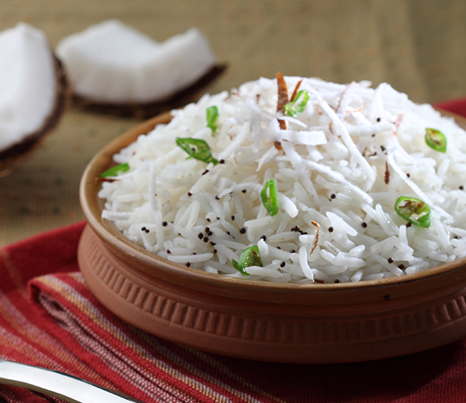 Coconut rice is simply delicious and a fun way to put a twist to your rice dishes. Heat the oil over medium-high heat in a pan and add the coconut flakes. Sauté until the coconuts turn golden brown. Take the coconut out and set aside to drain on paper towels. Cook the rice according to package directions with a pinch of salt. Turn heat on to medium-high and let rice come to a boil. Once the rice is done, add the sliced green chilies and the sautéed coconut flakes. Set the rice aside. While the rice sits, heat 1 teaspoon of oil on high heat. Add the mustard seeds and let them cook for about 30 seconds. Now add the cumin seeds and cook until the mustard seeds start to pop. Turn off the heat and stir in the mixture into the rice.